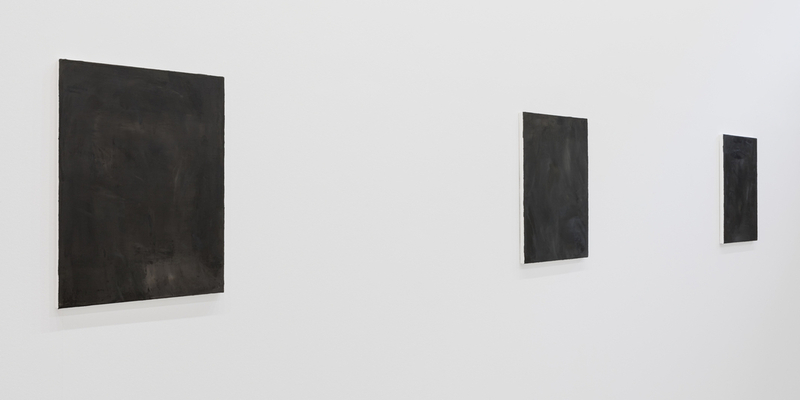 David Schutter’s three grayish paintings, all titled with variations of ANB M 109 (all works 2017), seem to turn their backs on the viewer, showing hardly any articulation or contrast. Once adjusted to the dark surfaces, though, one can discern some color in the mix, as well as a painterly hand at work. With time, distinctions appear between gestures, movements, lighter patches against dark: Is that a head, a ghostlike appearance, or just a wiped surface? A white-on-white silverpoint, Study Sheet for ANB M 109 1, executed blindly, completes the show, assuring us that the overall focus of these works is the borders of what is visible. The artist is a painter who studies the medium, referencing from memory his careful observations of seventeenth- through nineteenth-century paintings in his own work. A single nocturnal scene by Adolph Menzel from 1852, depicting the artist’s studio with a skull and arm casts reaching from the wall, served as Schutter’s inspiration. The artist is a skeptic in his refusal to show a clear subject matter or render it in a defined expression. He prefers the intangible, the veiled, or the invisible. And yet he is also a romantic for his meticulous dedication to old masters, to the point that genius and absurdity begin to compete throughout his work. He insists on painting as an act of perception that requires sensitivity to nuance and subtle gradations of light and color. Hiding in gray, he could be called a colorist in denial. After surrendering to the darkness, multicolor spectacles shine through.